I’m very happy to say I am officially now a candidate for a stem cell transplant at Northwestern University Hospital in Chicago! I got the go-ahead from my insurance company a week ago to move forward with my evaluation. Finally a step in the right direction treatment-wise. I have been literally riding a roller coaster for over four years trying to get approved for this transplant treatment. I originally went to be evaluated in North Carolina at Duke University Hospital about four years ago. At that point in my disease my lungs were getting worse. I was on oxygen occasionally at bedtime and my skin score was slowly getting worse. My doctor recommended Duke and before long I was down there undergoing a boatload of tests, procedures and consultations to see if I would be eligible for transplantation. A whole week of back-to-back tests. It was so much fun! Not! A month later we returned for my results which for the most part were right in line with their protocols – or so I thought! The only concern they voiced to me was my lung function; specifically, the DLCO was a little too low for their liking so I was put on a six-month treatment plan of infusions once a month with a drug called Cytoxin. Cytoxin is a drug they normally use for cancer patients, but with scleroderma it is supposed to help lung function and in some cases, scleroderma skin involvement. I had done eight treatments of Cytoxin prior to arriving at Duke about six years before and it did not really change anything. But I thought, “What the hell, let’s give it a go!” So back to Buffalo I went for six months of Cytoxin infusions. Which, by the way, was horrible, in every sense of the word! The treatment itself makes you nauseous, sick to your stomach, vomit and exhausted, and that is just the day of treatment. It also makes your hair thin and start to fall out and it gave me horrible migraines. But I battled it out because I wanted/needed that stem cell transplant so bad! About four months into my treatments I revisited Duke for a follow-up and to get a breathing test (pulmonary function test) to see if the Cytoxin was at all doing its job. It wasn’t! As a matter of fact, even though over these last four months I had been told by their staff I was doing well and the Cytoxin was successful, apparently my lung function was worse off than it was when I started the treatments! At that point I was blindsided because I was under the impression I was doing well and was very close to being accepted for transplant. However, I guess that wasn’t the case according to my pulmonary function test and the fact that the doctor came in and straight up told me I was not a candidate for stem cell transplant and I would not be treated by them any more. Shock was the first emotion to run through my body. The next was anger! How could I not be a candidate? I was told for almost two years that everything was moving forward and I had the green light! I felt lied to and completely taken advantage of. Oh, and I was told I had heart issues that didn’t fit the protocol which was never mentioned to me once the whole year and a half I was treated by them! I of course was kind of bummed they wanted me to repeat all of the tests I originally had done in North Carolina because it was only a year ago, but I guess I had to do what I needed to do. I was in the process of making plans to go to Chicago for my evaluation when out of nowhere I started to have these weird episodes where my vision would go blurry. I would have ringing in my ears, my tongue would go numb along with my lips and my heart would race! Eventually it would go away, but I had a total of three of those episodes and each time they lasted longer and longer. Until one evening when I returned from dinner with my parents. All of a sudden I started to have the same symptoms, but then my heart just started to pound and I felt like I couldn’t breathe and if I sat up I felt dizzy. I ended up in the ER and was diagnosed with atrial fibrillation. I was put on heart medication and released the next day. So now I needed a cardiologist. After having three more of these ER trips in the time span of over a month, my cardiologist decided I needed to do something more than medication because the problem wasn’t getting fixed. I then saw a heart specialist in Pittsburgh who told me I needed a cardiac ablation. A cardiac ablation is a procedure that is used to scar small areas in your heart that may be involved in your heart rhythm problems. This can prevent the abnormal electrical signals or rhythms from moving through the heart. At that point I had to make the decision to postpone Chicago and my transplant evaluation. Fast forward another two years and two cardiac ablations later. My heart is stable and doing well, as are my lungs. I found a medication for my lungs that seems to be helping and it’s a infusion once a year. However, my skin score is not getting any better; it seems to be getting worse. And despite my lung tests showing stability, I’m having trouble with my breathing and sleeping. Basically my scleroderma is still active and progressing. I needed a solution to level things off and stabilize my disease. At that point I decided Chicago was my only option and I contacted them in hopes they would remember me and agree to help me again. Luck was on my side – they did in fact remember me and were willing to have me back for evaluation just like that! Wow, it was almost too easy, right? Two weeks after I got the go-ahead from Chicago to start making my arrangements to come down, I received an email from the charge nurse stating that the hospital was having an issue with my insurance and they did not know when the issue would be resolved. In other words, I was being put on hold until they fixed this insurance issue! Derailed once again, to say I was upset would be putting it lightly! I really could not do anything but sit and wait. So I moved forward with my life and just kept my fingers crossed that it would work its self out. Two months later I received another email from the charge nurse stating everything was a go! I couldn’t believe my eyes. I actually read and reread the email five times to be sure. Finally, after all this time, I was getting the opportunity to be evaluated and hopefully have a chance at a lifesaving procedure that can possibly put my disease into remission and give me a better quality of life. I’m so overjoyed. I know I still have a long way to go before I’m actually told “yes” I can receive a transplant, but I am just so happy I have made it this far. 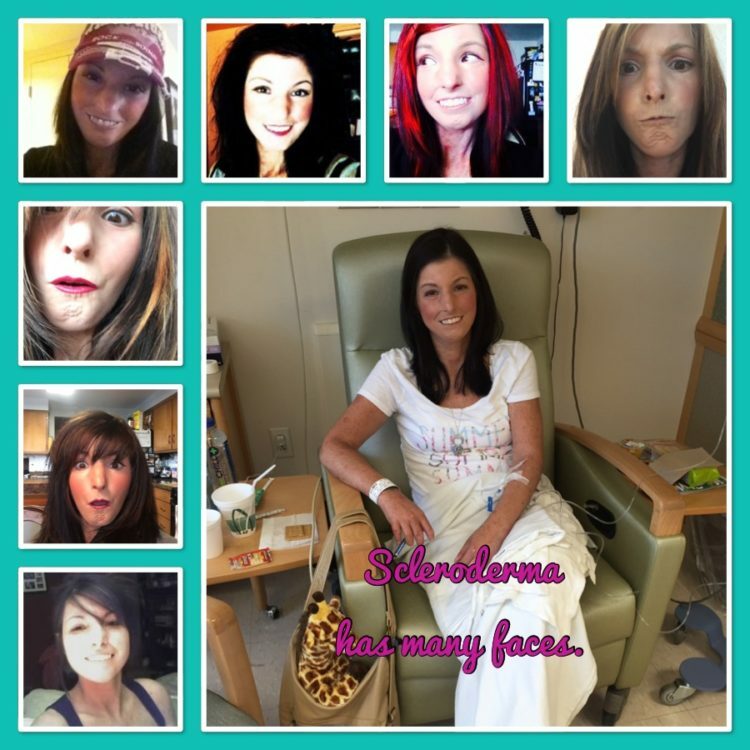 For 16 years scleroderma has taken charge of my life and steered me in the direction and to the places it wanted me to go. It has dictated where I go, when I go, with whom I go with and actually if I even get to go. Having the opportunity to get this stem cell transplant, I finally feel like I can be the driver in my life and scleroderma will not get to tell me where to go or how to live anymore. Do not get me wrong, I know this is not a cure and the damage that scleroderma has done will remain, but if I get the chance to be in remission and possibly not get any more sick than I am now, I would gladly take that option in a heartbeat. Now I can only wait for my appointments in November and keep my fingers crossed that this time I don’t get that awful word “no!” like I got four years ago. Hearing “yes!” would be the best day of my life!